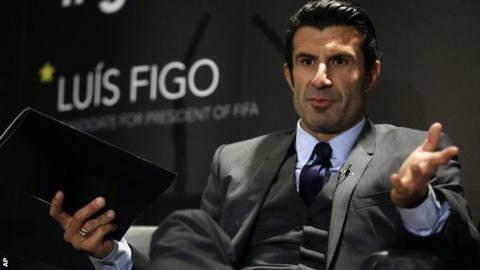 Luis Figo has joined Michael van Praag in withdrawing from the Fifa presidential election on 29 May. Ex-Portugal midfielder Figo, 42, pulled out on the same day as Van Praag, 67, to leave Prince Ali Bin Al-Hussein of Jordan as Blatter's only rival. Blatter is favourite to win a fifth term as president and Figo said: "This process is anything but an election. "This process is a plebiscite for the delivery of absolute power to one man - something I refuse to go along with." Each of Fifa's 209 member associations have a vote in the election and Van Praag, who is president of the Dutch football federation, says he will now support Prince Ali. The English Football Association also intend to support Prince Ali, while the Scottish FA had previously said they would back Van Praag. The Dutchman held a joint news conference with Prince Ali in Amsterdam on Thursday, urging his supporters to get behind the Jordanian to unseat Blatter. "Prince Ali Bin Al-Hussein convincingly demonstrated that at this moment in time he is the candidate who has the biggest chance to challenge Sepp Blatter," Van Praag said. "It is impossible that Fifa moves on with its current presidency," he added. Figo also highlighted the need for change in his withdrawal statement. "I travelled and met extraordinary people who, though they recognized the value of much that had been done, also concurred with the need for change, one that cleans up Fifa's reputation as an obscure organization that is so often viewed as a place of corruption," he said. "I have seen with my own eyes federation presidents who, after one day comparing Fifa leaders to the devil, then go on stage and compare those same people with Jesus Christ. Nobody told me about this. I saw it with my own eyes." He also questioned an election process in which a main candidate - Blatter - had not produced a manifesto "so that federation presidents know what they're voting for". Figo added: "There has not been a single public debate about each candidate's proposals." The latest withdrawal comes after another presidential candidate, Frenchman Jerome Champagne, a former Fifa deputy general secretary, pulled out in February. Former Tottenham and Newcastle midfielder David Ginola, backed by a betting company, originally announced his intention to stand against Blatter in January, but withdrew two weeks later. The vote will be held in Zurich at Fifa's annual congress and requires the winning candidate to secure a two-thirds majority in the first round of voting. If subsequent rounds are required then a simple majority is all that is required for victory.